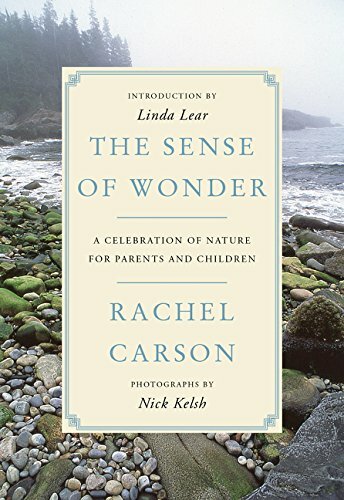 Rachel Carson's iconic book, The Sense of Wonder, first appeared as an article in Woman's Home Companion under the title, "Help Your Child to Wonder." It was published in 1965 after her death as a slim book with beautiful, abundant photographs of the wilds of Maine, and contains one of my favorite quotes. Rachel Carson "affirms her belief that those who live with the mysteries of earth, sea and sky are never alone or weary of life. She would endow every child with 'a sense of wonder so indestructible that it would last throughout life.'" (from the book jacket). I think a definition of 'wonder' has to include taking the time to look. Someone who can slow down enough from the pressing and the urgent to pause and notice. Wonder springs from curiosity, the willingness to ask questions. and the simplicity to admire what it discovers, whether the beautiful, the unexpected, the unfamiliar, or ultimately the inexplicable. One who sits and ponders does not seem to be getting anything done. Though perhaps they are getting some of the best things done: thinking, looking, enjoying, connecting. Actions that are not easy to measure or reward, but perhaps are their own reward. Rachel Carson's inspiring quote suggests this is best insured by the companionship of a wondering adult. Many people are not blessed with such a companion. Especially in our culture of haste and skim. However, I do believe there are children so naturally endowed with that sense of wonder that though they were not encouraged as a child, they nevertheless keep that spark alive throughout adulthood. Such a child was my mother. She placed this statue in her garden to remember the hours she spent watching and pondering the ants and other insects she saw as a child (for which she endured no certain amount of ridicule). Since it is her birthday this week, I thought I would pause in all this blog-writing, child-rearing, school-year busyness to ponder her gift of showing me how to see and say, 'Thank you'. I am thankful that my mother is someone who thinks it normal to notice nature, and nurture it; to photograph and paint and encourage others to enjoy making art, however humble their natural talents; to run several community art groups, help curate art shows; and generally grow and create around her a world of beauty and color. I do believe that the essence of sketchbooking is rediscovering that lost sense of childhood wonder, whether in the slowly seen details of nature, the fleeting season or a newly known place. Rachel Carson invites us to value the sense of wonder. My mother has managed to keep this treasure alive through a lifetime of working and is now free to enjoy it more fully. And my goal with this blog is to continue that companionship and inspire you to wonder too. Growing, painting, caring, wondering: thank you, Mum, for showing me to how to wonder.